The Holy Cross Sermons: God is Good - All the Time!!! God is Good - All the Time!!! Well, you have had a bit of a break from our Old Testament stories. As I looked at these passages, with new eyes, it seemed to me that there was an uncanny likeness to in the story to our Gospels. That first Sunday Peter was with you, the reading was about the awful conditions for God’s people in Egypt, as well as the story of the birth of Moses. Then there was the story of God’s call to Moses to lead the people of Israel to freedom. As a sign or seal of this call amazing things happened as the Pharaoh would first agree to let the people go, and then change his mind – nine dramatic plagues leading up to the Passover - that dramatic sign of God’s covenant with Israel through which they gained their freedom. So this covenant is established and the people are now free – but, of course, that is just the beginning of the journey. They were hardly out of the clutches of the Pharaoh when they were confronted with an insurmountable barrier – a vast expanse of water. This was a test of their faith, wasn’t it? Indeed, the people are to confront a number of such “tests” for want of a word, and sadly they weren’t quite up to it. I am sure that as we read this story just now – of the people crossing the sea as if on dry land – your mind was filled with some of the various Film and TV images that people have tried to create to give us a sense of what this event might have been like. I don’t know about you, but I find this a mind-boggling thing to try and imagine. Some people have tried to create a naturalistic explanation for this event – which may or may not make sense to you, I am not going to go into that. What I want to do is step back from this story a little bit and see what God might be wanting to say to us today. As I reminded our little group on Thursday morning, this story, in its present form, was created only about 500 years before Jesus was born. It was talking about events that had happened over 2500 years before Jesus was born, and the essence of the story probably goes back close to that time. The important question to ask is why did they tell the story in this way – what was it saying to the people who first heard it in this form? Let’s think about who those first listeners might have been. These are the people who had most recently lived through a long period of exile or captivity in a land far away from their homeland. A hundred years or so before they had been taken into Captivity in Babylon. Babylon had then been incorporated by force into the Persian empire – the Iraq-Iran conflict goes back a long way. Cyrus of the Persians was the one who gave permission for Nehemiah and the people to go home to rebuild the walls of Jerusalem. So their experience was an almost exact echo of the experience of the Israelites in this story. They had been living far away from their homeland and were being kept there by force. Now they were coming home. If we were to think about this story as if it were a parable I think it can give us some idea of what it might have meant to the people of Israel, and maybe for us today. When we ordain someone a priest we say they are ordained to a ministry of the word and sacrament. When we come here on a Sunday to celebrate holy communion we participate in a service of word and sacrament. This idea of word and action is at the heart of our relationship with God. This story in the life of Israel, both right back when they were leaving Egypt, as well as when they were leaving Babylon, is a story of word and action. The WORD of God is expressed in the covenant established in the Passover. This covenant is a bit like a codicil to a will because it really just adds to the covenant God entered into with Abraham, and which was reiterated for Isaac and Jacob, namely that God would bless them with many descendants and that through them the whole world would be able to receive God’s blessing. The ACTION comes in the wonderful – amazing – ways God looks after the people, despite their wilfulness and rebellion. 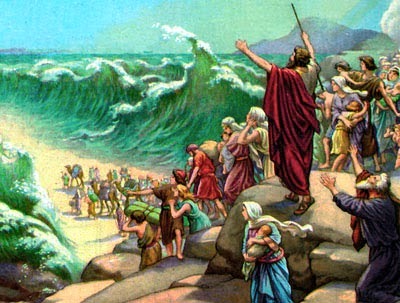 When I think about that Red Sea image of the walls of water towering up on either side as a metaphor it conveys so clearly the idea of all those forces that seem to be against us being held at bay by God. Here is a dramatic portrayal of God’s determined action to bring us to safety, to the land of promise. This may well be exactly what the writers of this story really wanted the readers to understand. There they were gradually coming back to the land they had been promised, rebuilding the walls of their holy city, and they were being encouraged to look back at the marvellous ways God had held back all those forces that were against them to enable them to arrive in that place. This is a good thought for us, too. Whatever your journey of faith might have been, you will certainly be able to identify forces that were at work in keeping you away from the joy of your relationship with God. But somehow, by the grace of God, you arrived in this place of being in relationship with God and each other. This story is about putting a spring in your step, some joy in your soul, by reminding you that God is Good – no matter what forces may have been stacked up against you. All the time – God is good.